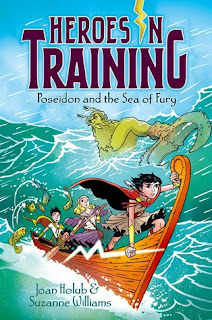 After pulling a magical thunderbolt from a stone, ten-year-old Zeus goes on the adventure of a lifetime in this thrilling start to a brand-new series! The terrible Titans–merciless giants who enjoy snacking on humans–have dominated the earth and put the world into chaos. But their rule is about to be put to the test as a group of young Olympians discover their powers and prepare to righteously rule the universe…. Zeus gets his wish–and a lot more than he bargained for–when he is kidnapped by dangerous, giant Titans! In self-defense, he grabs the first thing he sees–an actual thunderbolt he pulls from a stone that is covered in mysterious markings. 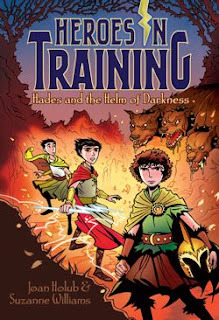 Zeus is the only one who can decipher the markings and sets off on a quest to rescue his youthful fellow Olympians from the evil Cronus. 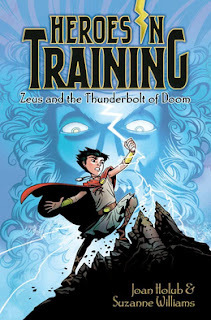 Armed with his trusty thunderbolt (named Bolt, of course), Zeus is on an adventure of a lifetime–and a journey to fulfill his destiny as King of the Gods. 1 Winner will receive either a $100 Amazon Gift Card or Paypal Cash! Open to U.S. residents only. You must be 18 years old to enter to win. See Rafflecopter for entry details. This giveaway ends 12/9/12. Winning Entry will be verified prior to prize being awarded. No purchase necessary. You must be 18 or older to enter or have your parent’s permission. The winner will be chosen by rafflecopter and announced here as well as emailed and will have 48 hours to respond or a new winner will be chosen. This giveaway is in no way associated with Facebook, Twitter, Rafflecopter or any other entity unless otherwise specified. The number of eligible entries received determines the odds of winning. VOID WHERE PROHIBITED BY LAW. Disclosure: I was not provided with product for this giveaway. In exchange for this post, I received a link on the Rafflecopter form. The Review Wire’s 7th BLOGiversary! Thanks for letting me know. I sent a message to the host of this giveaway so she can update the RC form.